Weighing almost six tonnes and measuring 13ft square, the world’s biggest bar of chocolate has been made in Derbyshire. 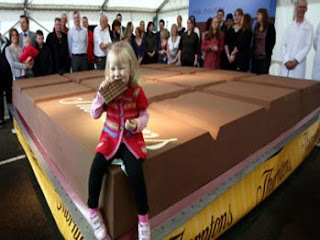 The giant bar, weighing almost six tonnes, was created by confectionery firm Thorntons to mark its centenary. Guinness World Records confirmed the huge bar had beaten the previous record set by a Chicago chocolate maker in September. More than 50 staff helped construct the massive bar at Thorntons’ factory in Somercotes. A giant mould, placed inside an inflatable tent in the factory’s car park, was filled with chocolate over 10 hours by bucket-carrying volunteers. Its final weight was 5,827kg (12,846lb) - beating the previous record of 5,529kg (12,190lb) set by World’s Finest Chocolate. The record attempt was the idea of Paul Bell, who works in the factory’s toffee department. He said: “My favourite childhood film was Charlie and the Chocolate Factory. There was a scene in it where a massive chocolate bar comes in and gets shrunken. “I thought it would be great if we could do the reverse. It’s been a really great success.” The company said the giant bar would be smashed up and sold in stores to raise money for charity.